At the moment I am completing a series of underwater paintings. Most of these paintings will be very colourful and have a cosmic element to them. For me, underwater paintings are similar to paintings of outer space. There will be a lot of jellyfish, seahorses, etc in these paintings. This series of underwater paintings will explore light and colour. Consequently, they will mix different media, including oil, ink, resin and other media. They will also seek to show the ‘other worldly’ nature of pictures representing under the sea. This is one of the first paintings of the series. It is called Jellyfish. This painting uses oils and inks and resin. I hope to complete a series of these for an upcoming exhibition. Techniques used in the underwater paintings. These underwater paintings will be painted using many layers of paint and other media. The paint comes first. Then a layer or two of ink is added. More layers of oil and ink are added to increase the depth and the inner glow of the paintings. Finally, a layer of resin will be added to give increased depth and colour to the works. Not all the paintings will use resin. 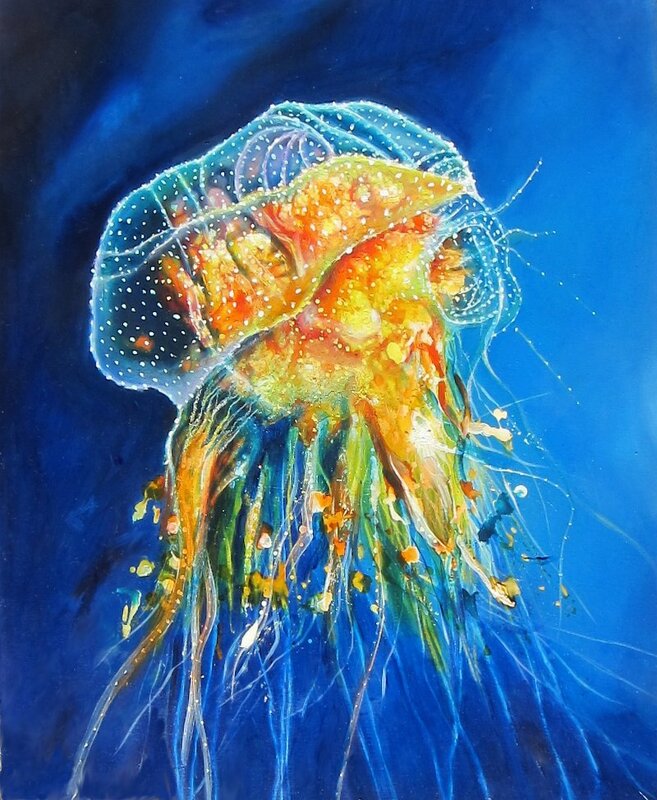 These paintings will be portraits of jellyfish (like above), while others will have varying amounts of depth to them. These paintings will tend to be larger. Under the sea is like another world. Hence, it is an alien world where strange creatures inhabit. A cosmic element will be infused into the works emphasising the unfamiliar nature of this aquatic world. Therefore, these paintings will lean towards being surreal. All the paintings will be ready to an exhibition due in mid January, here in Coffs Harbour. Hence, all the paintings will be for sale. I will tell everyone of the details of the exhibition in the coming weeks. 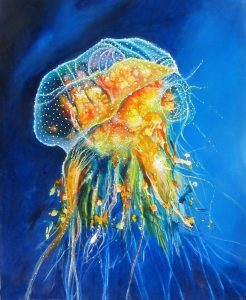 This entry was posted in Uncategorized and tagged cosmic, jellyfish, jellyfish paintings, marine, marine paintings, surreal, surreal paintings, underwater paintings on November 16, 2018 by Lenny.